German officers have arrested a man after a Manchester City supporter was left fighting for his life following the club's game against Schalke. 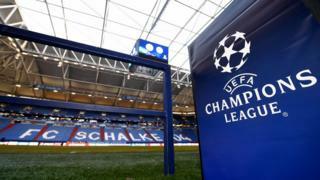 Gelsenkirchen police said a 30-year-old suspect was arrested following "a violent clash" shortly before the end of Wednesday's Champions League match. He has not been named but police said the suspect was a member of the Schalke "ultras" - also known as the "Hugos". The victim, 32, has brain injuries and remains in a critical condition. He has not been publicly identified but was involved in a violent confrontation with two Schalke supporters inside the Veltins Arena, police said. The suspect was in custody, a joint statement from Gelsenkirchen police and the German public prosecutor's office said. Gelsenkirchen police set up a homicide division to investigate the alleged assault and "their extensive investigation led to the timely identification of a suspect," the statement continued. He was arrested at 10:00 GMT on 25 February in the Buer district of the city. According to the statement, the suspect was a member of the "Hugos" - a "problematic" section of Schalke supporters. A date for the court hearing has yet to be announced. Last week German police said the victim had "received a blow from a fist which knocked him to the floor". "In falling, he suffered a massive trauma to his skull and brain," the police force said. The man's family are being supported by Greater Manchester Police (GMP), and some members of City's staff who have stayed in Germany.